This article is about the English-born South African activist. For the American pastor, see Cecil Williams (pastor). Cecil Williams (1909–1979) was an English-South African theatre director and anti-apartheid activist. Sophiatown, also known as Sof'town or Kofifi, is a suburb of Johannesburg, South Africa. Sophiatown was a legendary black cultural hub that was destroyed under apartheid, rebuilt under the name of Triomf, and in 2006 officially returned to its original name. Sophiatown was one of the oldest black areas in Johannesburg and its destruction represents some of the excesses of South Africa under apartheid. Despite the violence and poverty, it was the epicentre of politics, jazz and blues during the 1940s and 1950s. It produced some of South Africa's most famous writers, musicians, politicians and artists. John Venner Hodgson (1913–1970) was a footballer who played in the Football League for Doncaster Rovers and Grimsby Town. The South African Congress of Democrats (SACOD) was a radical, left, white, anti-apartheid organization founded in South Africa in 1952 or 1953 as part of the multi-racial Congress Alliance, after the African National Congress (ANC) invited whites to become part of the Congress Movement. The Pan-African Congress — following on from the first Pan-African Conference of 1900 in London — was a series of seven meetings, held in 1919 in Paris, 1921 in London, 1923 in London, 1927 in New York City, 1945 in Manchester, 1974 in Dar es Salaam, 1994 in Kampala, and 2014 in Accra that were intended to address the issues facing Africa as a result of European colonization of most of the continent. Fatima Meer was a South African writer, academic, screenwriter, and prominent anti-apartheid activist. Inkosi Albert John Lutuli, also known by his Zulu name Mvumbi, was a South African teacher, activist, Nobel Peace Prize winner, and politician. Luthuli was elected president of the African National Congress (ANC) in 1952, at the time an umbrella organisation that led opposition to the white minority government in South Africa, and served until his accidental death. He was awarded the 1960 Nobel Peace Prize for his role in the non-violent struggle against apartheid. He was the first person of African heritage to be awarded the Nobel Peace Prize. Luthuli was a lay preacher of the United Congregational Church of Southern Africa (UCCSA) based at its Groutville Congregational Church in Stanger, KwaZulu Natal, where Luthuli was laid to rest upon his passing in 1967. Donald James Woods, CBE was a South African journalist and anti-apartheid activist. As editor of the Daily Dispatch, he was known for befriending fellow activist Steve Biko, who was killed by the police after being detained by the South African government. Woods continued his campaign against apartheid in London, and in 1978 became the first private citizen to address the United Nations Security Council. 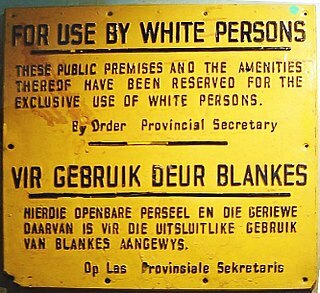 The Defiance Campaign against Unjust Laws was presented by the African National Congress (ANC) at a conference held in Bloemfontein, South Africa in December 1951. The Campaign had roots in events leading up the conference. The demonstrations, taking place in 1952 were the first "large-scale, multi-racial political mobilization against apartheid laws under a common leadership." Ernest Urban Trevor Huddleston was an English Anglican bishop. He was the Bishop of Stepney in London before becoming the second Archbishop of the Church of the Province of the Indian Ocean. He was best known for his anti-apartheid activism and his book Naught for Your Comfort. Allan Aubrey Boesak is a South African Dutch Reformed Church cleric and politician and anti-apartheid activist. He was sentenced to prison for fraud in 1999 but was subsequently granted an official pardon and reinstated as a cleric in late 2004. The Treason Trial was a trial in Johannesburg in which 156 people, including Nelson Mandela, were arrested in a raid and accused of treason in South Africa in 1956. Denis Goldberg is a South African social campaigner, who was active in the struggle against apartheid and was imprisoned for 22 years, along with other key members of the anti-apartheid movement in South Africa. After his release in 1985 he continued to campaign against apartheid from his base in London with his family, until the system was fully disbanded with the 1994 election. He returned to South Africa in 2002. The Shell House massacre was a 1994 shooting incident that took place at the headquarters of the African National Congress (ANC), in central Johannesburg, South Africa in the lead up to the 1994 elections. Benjamin Pogrund is a South African-born Israeli author. Thomas Titus Nkobi was a senior leader of the South African African National Congress (ANC) and a key figure in the Anti-Apartheid movement. Until his death he was the Treasurer General of the ANC and also its Member of Parliament. Peter Magubane is a South African photographer. Amina Cachalia, OLB was a South African anti-Apartheid activist, women's rights activist, and politician. She was a longtime friend and ally of former President of South Africa Nelson Mandela. Her late husband was political activist Yusuf Cachalia. Her son, Ghaleb Cachalia, is a politician in the Democratic Alliance. Evelyn Mase was a South African nurse, who was the first wife of the anti-apartheid activist and future politician Nelson Mandela, to whom she was married from 1944 to 1958. She was the mother of four of his children, including Makgatho Mandela and Makaziwe Mandela. ↑ Louise Jury (15 May 1999). "Film celebrates gay hero who drove with Mandela". The Independent. 1 2 3 4 Smith 2010, p. 199. ↑ Smith 2010, p. 124. 1 2 Meredith 2010, p. 213. 1 2 Smith 2010, p. 166. ↑ Simpson 2011, p. 170. ↑ Simpson 2011, pp. 170–171. ↑ Simpson 2011, p. 171. ↑ Meer 1988, pp. 201–202; Simpson 2011, p. 171. ↑ Meer 1988, p. 202. ↑ Simpson 2011, pp. 171–172. ↑ Meredith 2010, p. 227. ↑ Filling, Brian (2016). The Glasgow Mandela Story (2nd ed.). ACTSA Scotland. ISBN 978-0-9556538-5-8. Meer, Fatima (1988). Higher than Hope: The Authorized Biography of Nelson Mandela. London: Hamish Hamilton. ISBN 0-241-12787-4.